Pickled cabbage is my childhood favorite. When my mom comes to visit me as she does annually, pickled cabbage is at the top of the most-requested list. This time, I asked her to make me enough to last me through the winter. It's a wonderful side dish for any meal, lightening the palate between bites - or a guilt-free snack for any diet. 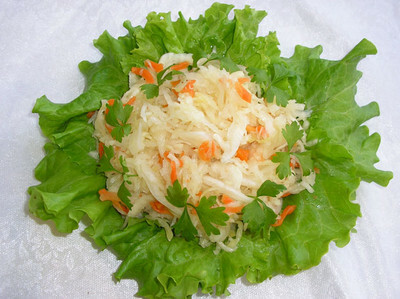 The primary difference between pickled cabbage and sauerkraut is in the length of the fermenting process, days instead of weeks. As a result, it has a fresh salad-like taste instead of the overpowering "sauer" in sauerkraut. The best part - it keeps forever (well, nearly) and it's quite simple. When buying cabbage, make sure it looks crisp, and does not feel soft. It is best to use an enamel pot so the fermenting process does not ferment the seasoning off your cookware. Place about two inches of cabbage in the pot. Grate 1/4 cup or so carrots loosely on top. Sprinkle a tablespoon of salt. Repeat layer by layer. When finished, squash the cabbage as much as possible, using fists works well, until it gives juice. Place a plate or lid on top of the final layer. It should fit inside the pot, leaving an inch or less around the edges. Put something heavy: a brick, a rock, a jar of water on top, to keep the pressure on the cabbage. Keep the pot at room temperature during the fermenting process. Each day, open the plate and poke deep holes in the cabbage to allow gas to escape. Press the plate and the weight back on. Fermenting usually takes 4-5 days. Don't hesitate to taste it. Longer fermenting process will result in more sour cabbage. Place in jars, squeezing out most of the juice and refrigerate. Fill the jars to the top, squashing the cabbage - they'll keep longer. Certainly for 3-4 months. I have found a youtube video describing the making of pickled cabbage. It looks very similar to what my mom does. One exception is, my family does not hesitate making a large pot while the lady recommends a small amount. Just don't forget to press down on the cabbage each day, allowing it to give off more juice, and make holes! Also, the Choose-Healthy-Food blog article, which includes this video has a variety of tips on making/troubleshooting the process. I hope it helps! I blog about paleo lifestyle and my own ways of making paleo work for me and my family at Cave Kitchen. I Am Cavewoman, Hear Me Grunt! Do You Like Modern Paleo?